Paul Dresher and Daniel Schmidt have collaborated on invented instruments since the mid-1970s. Their initial inventions were for American Gamelan and were often in dialogue with composer Lou Harrison and his partner Bill Colvig. Their current inventions fall into two general categories. 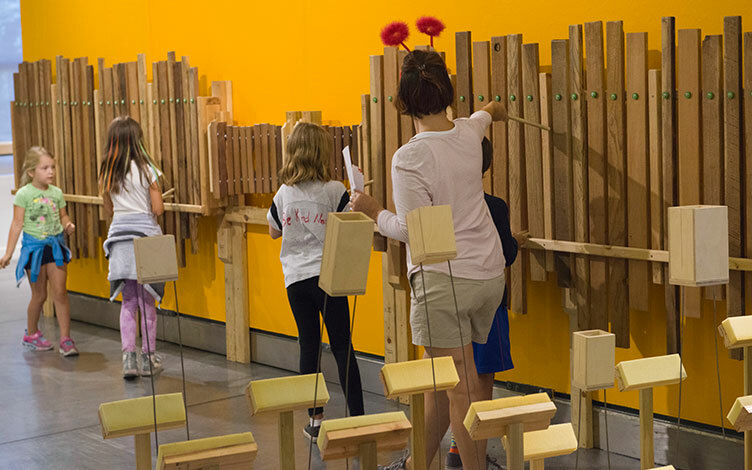 The first includes visually beautiful and easily played instruments/sound sculptures suitable for general audiences, including children. These instruments generally have one – or at most a few – means of producing sound. The inventions on display here are of this type. The inventions in the second group are complex, electro-acoustic instruments that require substantial practice and in experienced hands can express a vast range of musical textures and emotional content. Although general audiences have experimented with them, these instruments are designed for professional performances of concert and theatrical music by Paul Dresher and his collaborators, particularly with percussionist Steven Schick and Dresher’s long-time collaborator, Joel Davel, in the Dresher-Davel Invented Instrument Duo. This group can be heard in concert on June 7 & 8, 2019 at ODC Theater in San Francisco. Paul Dresher is a multi-talented composer who is uniquely able to weave contemporary classical, pop, minimalist, and South and Southeast Asian musical styles together into his own distinctive personal style. He creates in a myriad of different genres, including experimental theater, contemporary opera, acoustic and electronic chamber music, orchestral compositions, dance scores, and musical instrument invention. His solo percussion work Schick Machine (2009), was created for percussionist Steven Schick and performed on a set huge invented musical instruments and sound sculptures and his latest creation is Sound Maze (2015), a hands-on sound installation of twelve large-scale invented musical instruments and sound sculptures that is touring widely in the United States and internationally to both performing arts and interactive museum institutions. Extensive information about Dresher’s work can be found at www.dresherensemble.org and examples of works with invented instruments can be found by searching for Paul Dresher or Dresher Ensemble at YouTube. John Cage with the Boston Symphony, John Adams and the San Francisco Symphony, and worked closely with composer and inventor Lou Harrison on a number of projects. Daniel is well known for his contribution to creating the genre known as American Gamelan, broadening the range and timbral palette of traditional Indonesian designs and making the instruments more well-suited to the western compositional approach. He has long been a leader in field of American Gamelan &amp; Javanese music, and in that capacity has directed performances or had residencies at the Cabrillo Music Festival, the Oakland Museum, the Exploratorium, New Music America in San Francisco and Los Angeles, UC Berkeley, California Institute of the Arts, and the Berliner Kunstler Program (DAAD). His work with Paul Dresher has brought about two significant new instruments, the Quadrachord and the Hurdy Grande. They have also developed instruments for specific use in two large theatrical productions – Sound Stage (2001) and Schick Machine (2009) as well as for The Sound Maze (2015-18), a hands-on interactive installation work that has regularly toured the United States since its premiere in 2015.